I admit, I cheated a lot for this meal as there were a bunch of peeps to feed and I was essentially doing majority of the dishes and they needed to be ready in a hurry. First off, I had some left over rempah, which is the curry paste we usually make fresh from raw ingredients and pounded on the traditional mortar and pestle. Some of us cheat (ahem) but let's not tell my grandmother or she will give me hell. But when I say cheat, the only shortcut we use now is the food processor. Even then I might pound 1/3 of it in the mortar & pestle because I want the texture. And the taste of course. For some reason, the curries do taste better prepared the traditional way. Anyway, there was a ready pack of rempah and a nice packet of real Indian chilli paste for curry. None of that Sharwood's powdered business, thank you very much. Eeeuuwwww. I also had catfish so I cleaned and hacked it into cutlets. Making it is so simple, when you have your rempah ready, that it is embarrassing. Simple, eh? Tastewise, I would rank it as 8.5/10 as I prefer my curries a lot more spicy but I had to compromise because there are guests who were not born with a sambal bowl in their cots. Healthwise, it will score a lowly 6.75/10. All that coconut is really not that good for you but I can't resist curries. I also made a soup. 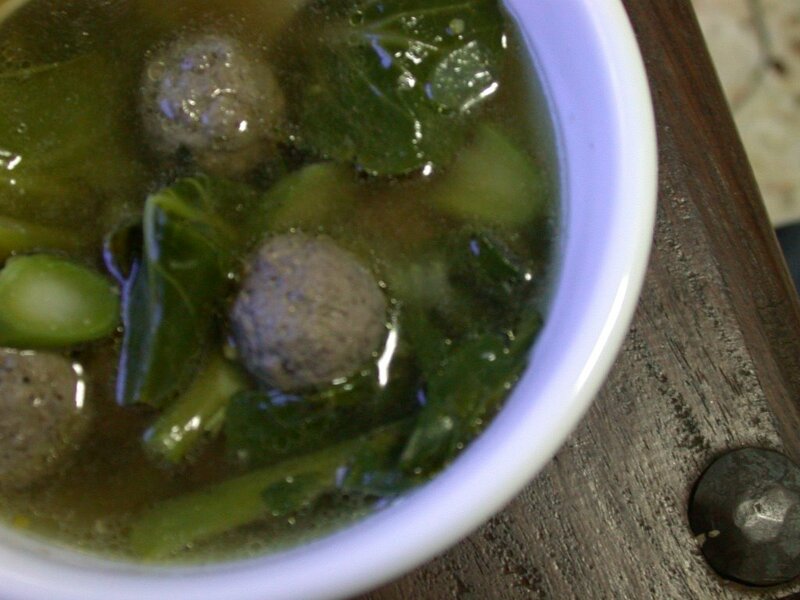 Beef balls soup with kailan. Simple and nourishing, the idea is that it should counter all the spicy food that was being served and would be an alternative dish for those who cannot eat spicy food. However, beef balls is something that my grandmother placed a lot of stock on. Beef balls were either packed full of spice or extremely hearty and meaty, Danish style but never the "wimpy" Chinese versions that lacked any spices. She forgave the Vietnamese and Thai versions because they had spices but every time she ate Chinese beef noodles, she would curl her lip in disdain to shame Elvis. So, I had to make my beef balls interesting enough not to get the infamous lip curl but also innocuous enough not to send the poor non-spicy eaters to the loo. So, I compromised. Ballsy beef balls but a clear broth with lots of veggies. I had to call it sup instead of soup in honour of my grandmother. This dish would have been a lot healthier if I did not deep fry the beef balls first but that's how my grandmother likes her beef balls as she claims that it makes the beef balls a lot more flavourful. You can omit the deep frying part if you want. With deep frying, the dish rates about 7/10 for health and about the same for taste. Note: Growing up, my grandmother would always use leftover curries for a late night supper. She would make curry noodles by adding in noodles to the leftover curries. 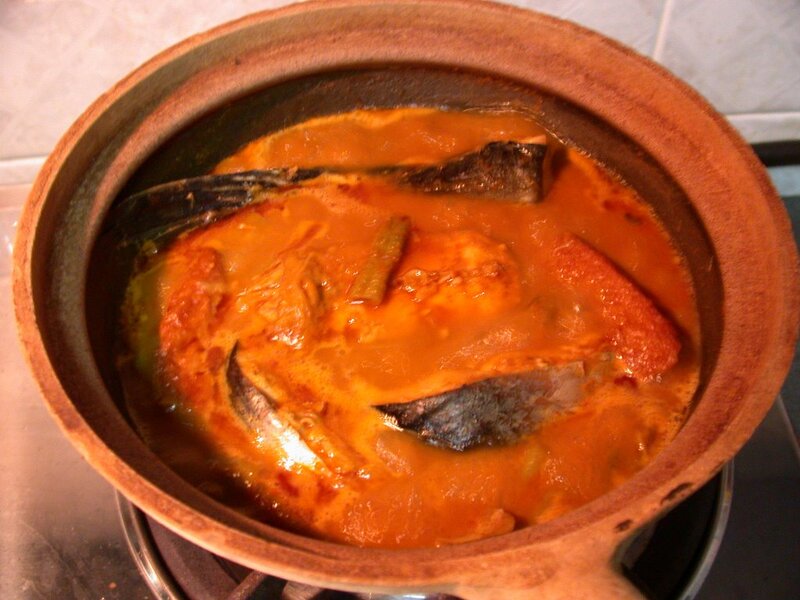 This was one of my fave suppers but I would not recommend using leftover fish curries because you might have pesky little fish bones that could prove dangerous. Also, you might find you have quite a lot of beef balls - I always keep some of the deep fried beef balls before I add them to the soup. These are great little snacks. I would zap them in the microwave with some salsa and have a neat little snack or add this to some pasta and pesto and voila! beefballs pasta! Also, they are great if peeps suddenly turn up (something I highly discourage as I am an anti-social cow) and you just zap them, add a cube of cheese and a cherry tomato and stick a skewer through the lot and you have a quick hor d'oeuvres. There are lots of nifty ways you can use them from canapes to main courses to supper dishes. But remember to zap them first as the deep frying would have only partially cooked them. I posted that you, you know. Knew you'd been hankering for another soup recipe. You know I never measure stuff unless I am baking so just wing it with the spices for the beef balls. I only put in the measurements based on guesstimation but it's probably a lot more. I tend to be a little heavy handed with my spices. Oh, I may be making a stew this Sunday is I do not have too much work to do so watch out for that. Ok, that catfish curry sounds devine! A. my favorite fish and B. my favorite spice. Now the tough part. At the risk of your family skinning you alive, would you be willing for us to add the recipe to our database? Two reasons. One, i want to make it for myself, and two, i am adding a spicy recipes page to our website, All Spiced Up! I think you can click on my name and it will take you to us. We want unique, out of the ordinary, and of course spicy. Please think about it, and if you or any of your readership have recipes to share, we would love to use them. Hi Mitch, thanks for your comment. It was very yummy and I would be more than happy to share it with your readers, if you attribute it to me. However, I would insist that you do not substitute the ingredients I have written with specific products from your site. Since I cannot vouch for how the end result will turn out, it might be wiser if you place a comment from yourself after testing out the recipe using your own spices. As to the exact proportions, I would not be able to share that with you - I am that afraid of my grandmother. She has ways to make me suffer. LOL. Oh and another note, Mitch ... I think it is hilarious that your partner John is a firefighter! Love the irony. Interesting site you have there - by the way, I was almost posted to Atlanta and actually attended a wedding in North Carolina.